Segara Anak is a crater lake located in the caldera of Mount Rinjani on Lombok Island, Indonesia. Segara Anak means child of the sea, given to blue color of the lake water, which is a reminiscent of the sea. Lies at an altitude of 2,010m above sea level, the lake was formed by volcanic eruptions of the ancient mountain Rinjani-Samalas in the 13th century, as recorded in an ancient manuscript called Babad Lombok. The highest peak of Rinjani at 3,726m above sea level today is the remnants of the ancient Mount Rinjani, while its twin Mount Samalas collapsed by the powerful volcanic eruptions and formed a caldera that later became the Lake Segara Anak today. 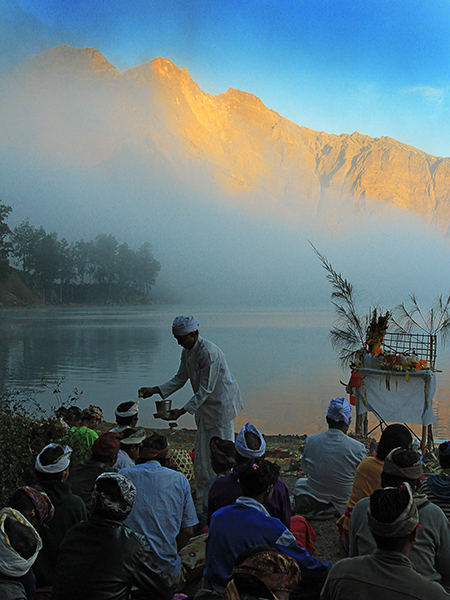 Part of the population in Lombok island embrace Hindu as their religion, and they assume that both Mount Rinjani and Lake Segara Anak are sacred. 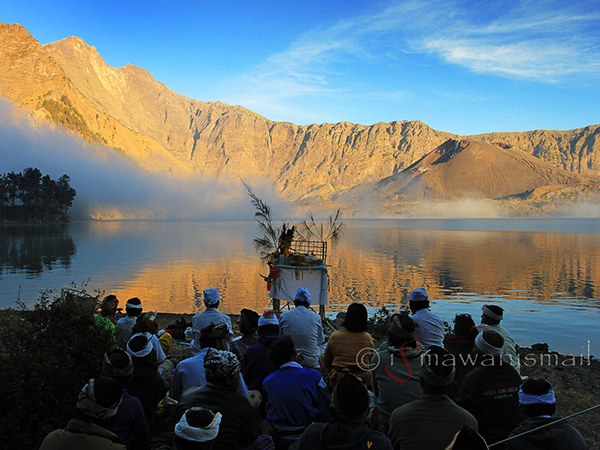 Hindunese people who are living around Rinjani regularly visit this beautiful lake to perform a worship rituals, save prayers, and present offerings. And I am lucky enough to meet one group of villagers when they are about to perform their worship rituals by the lakeside..
Actually I’ve already met this group villagers when we stayed overnight at Peropok. 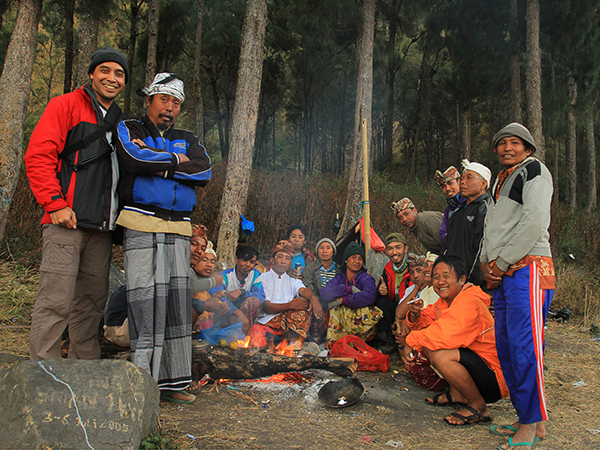 From our chit-chat with them, we knew that they will have a worship rituals by the lakeside on the following day. By then, it still hadn’t come into my mind to take their pictures when they do the rituals. All I had in my mind was landscape, as I tried to visualize the angles that I want to take, what time, etc. etc. In the morning, they set off early to the lake, while we were taking our times and not in a hurry at all..
We arrive at Lake Segara Anak at noon time. After ashar, Ghani, my trip buddy, and I set off to explore the lakeside. We walk down along the lakeside, heading West, looking for a good spot to take pictures. And there they are, the same group that we met at Peropok, preparing their worship. They immediately recognize and greet us. After a brief chat, they are ready to start. And out of blue, I have this idea to capture this moment instead. Apparently Ghani has the same idea.. The pedanda leads the worship rituals, and the whole group follow. The small bell at the pedanda’s hand chiming slowly while the sound of them humming when they chant their prayers filling the air. Ghani and I have already got their permission to take pictures, so we start getting busy with our cameras. Moving around very cautiously, we don’t want to miss anything while at the same time we don’t want to disturb their prayers. There’s times when I just stop taking pictures, just to enjoy the moment..
After the prayers, the pedanda and his assistants walking around splashing the holy water to each people. The rituals end with the pedanda and his assistants throwing all offerings into the lake while still chanting prayers. The worship ends there. Their face beaming, happiness all over the group after they finish the rituals. It’s very lucky for us to meet them, having the chance to explore closely their rituals and capturing the moments as well. Very friendly people. Typical Indonesian, I guess 🙂 They offer us to join them for dinner, but Ghani and I still have sunset to chase. So we bid farewell..
← Rinjani Trip – Torean To Peropok..
Lake Segara Anak is the remnant of a volcanic mountain named Mount Samalas, with an estimated height of 4200 metres.